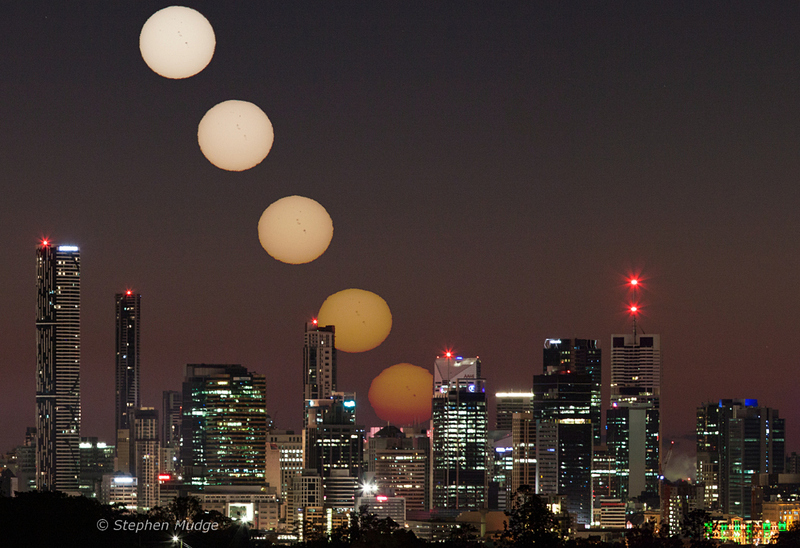 Explanation: In this composite cityscape, dawn's first colours backdrop the lights along Brisbane's skyline at the southeastern corner of Queensland, Australia, planet Earth. Using a solar filter, additional exposures made every 3.5 minutes follow the winter sunrise on July 8 as planet-sized sunspots cross the visible solar disk. The sunspots mark solar active regions with convoluted magnetic fields. Even as the maximum in the solar activity cycle begins to fade, the active regions produce intense solar flares and eruptions launching coronal mass ejections (CMEs), enormous clouds of energetic particles, into our fair solar system.